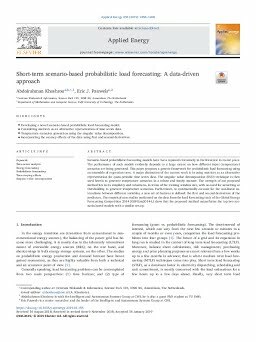 Scenario-based probabilistic forecasting models have been explored extensively in the literature in recent years. The performance of such models evidently depends to a large extent on how different input (temperature) scenarios are being generated. This paper proposes a generic framework for probabilistic load forecasting using an ensemble of regression trees. A major distinction of the current work is in using matrices as an alternative representation for quasi-periodic time series data. The singular value decomposition (SVD) technique is then used herein to generate temperature scenarios in a robust and timely manner. The strength of our proposed method lies in its simplicity and robustness, in terms of the training window size, with no need for subsetting or thresholding to generate temperature scenarios. Furthermore, to systematically account for the non-linear interactions between different variables, a new set of features is defined: the first and second derivatives of the predictors. The empirical case studies performed on the data from the load forecasting track of the Global Energy Forecasting Competition 2014 (GEFCom2014-L) show that the proposed method outperforms the top two scenario-based models with a similar set-up.